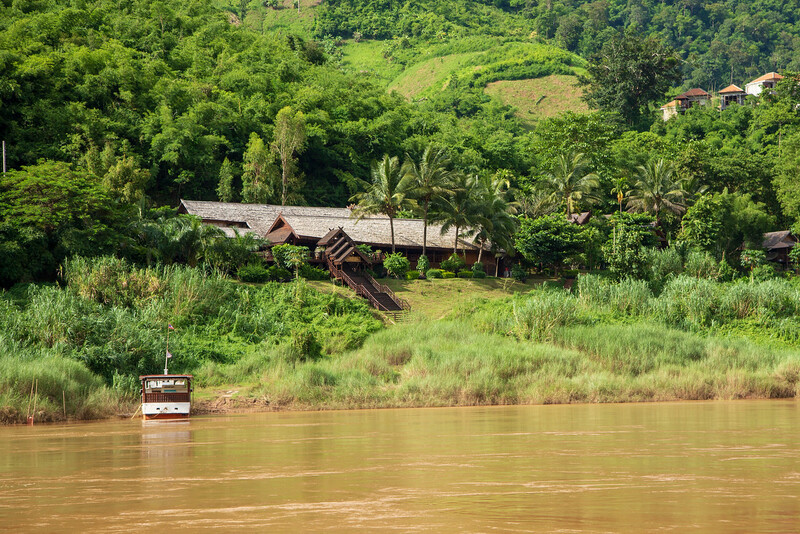 After a long day on our Mekong Cruise to Luang Prabang with Luang Say Cruises, we had the opportunity to overnight in style at the Lunag Say Lodge before beginning the next day’s cruise. What a pleasure! 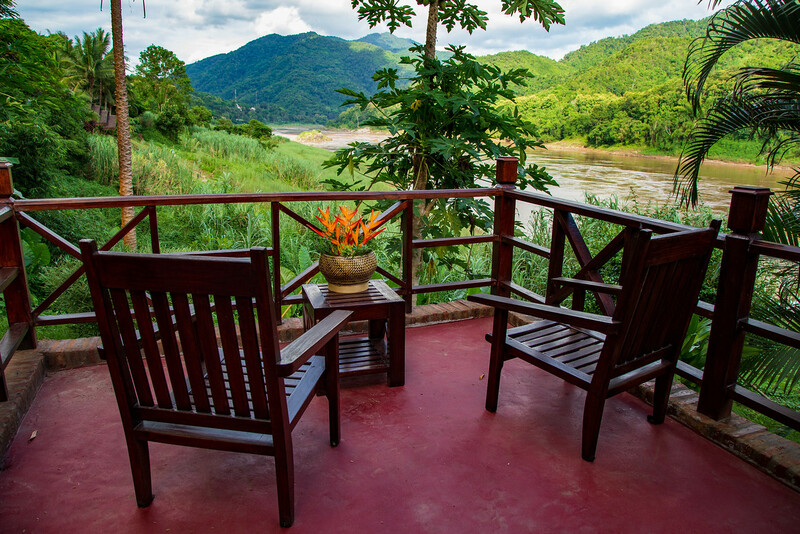 While on this retirement adventure I don’t always have the opportunity to stay in such comfort, particularly in places as remote as the river between Luang Prabang and Huay Xai, Laos. 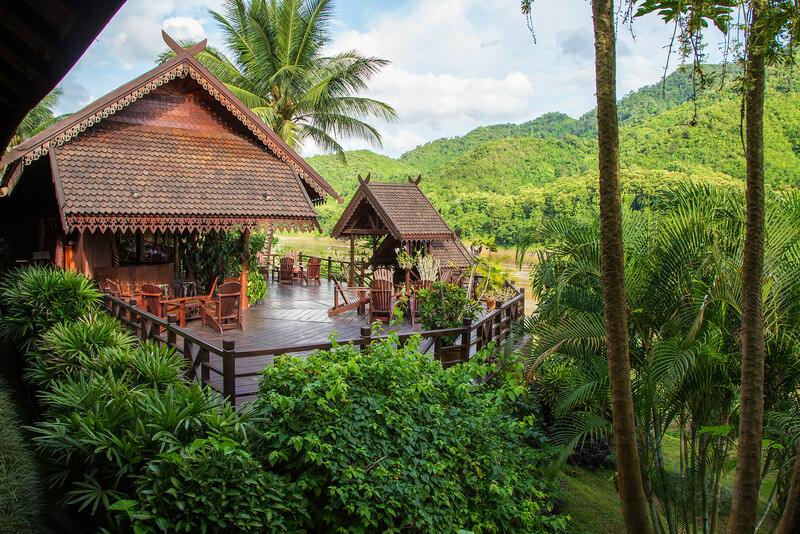 The Luang Say Lodge was a wonderful oasis in the jungle surrounding the Mekong River. 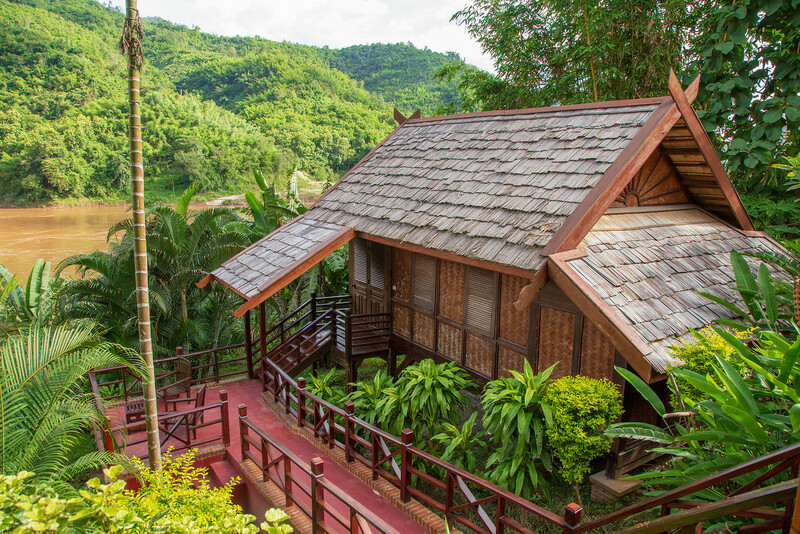 The lodge has 20 well-appointed eco-friendly bungalows built into a hillside overlooking the Mekong River; about halfway between Luang Prabang and Huay Xai near the tiny town of Pakbeng, Laos. The location is unique, to say the least. The rooms have decks perched above the riverbank where there was a nice breeze and stunning views. There is a road that runs behind the lodge along which you can walk 15 minutes to the scruffy but friendly and interesting town of Pakbeng. 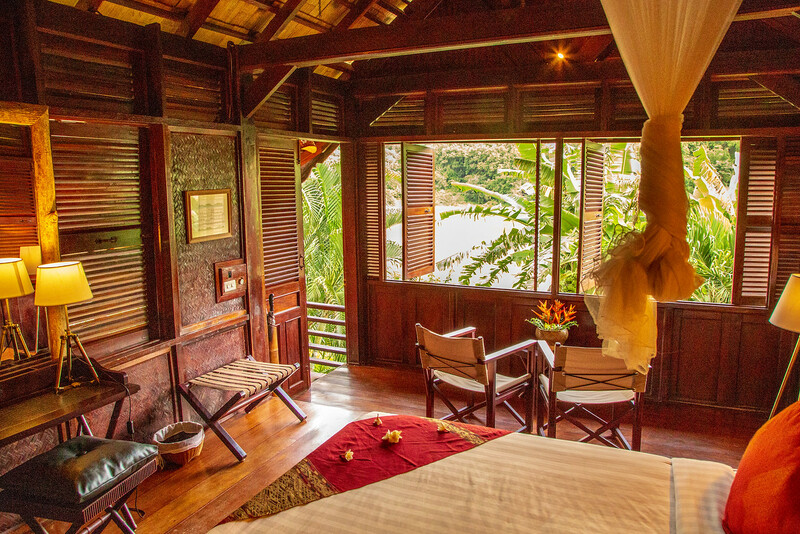 The bungalows are outfitted with dark wood interiors, tasteful lighting and shutters that give a tropically elegant feel. The rooms are simple but all of the furnishings are comfortable and of high quality. 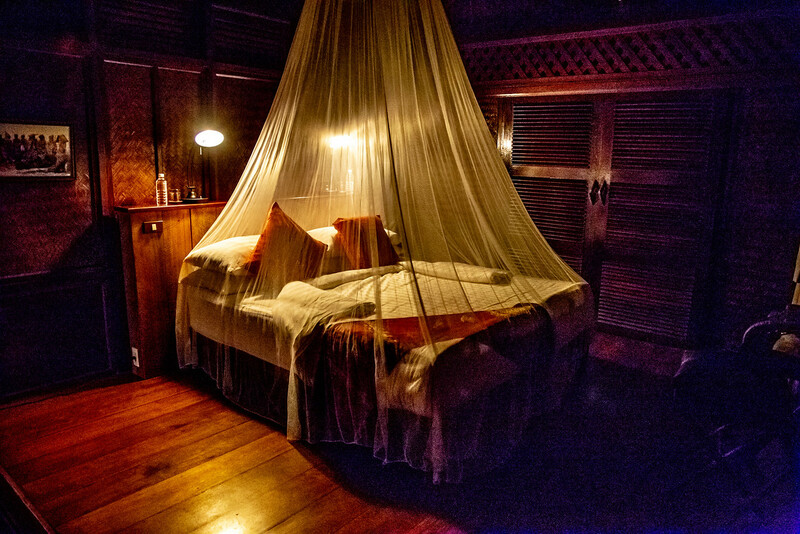 High thread count bed linens, old black and white photographs and even the mosquito net added to the ambiance. The room also had a small sitting area where you can contemplate the world and watch life on the river. There are high pitched roofs with openings to the outside for ventilation and even though the room wasn’t air-conditioned, with the fan on, even during the afternoon, the room was comfortable. The bathroom was simple but more than comfortable with dark woods, tile floors, and fluffy towels. There were all of the high-quality toiletries you could expect and something that you wouldn’t expect; a shower with plenty of high-pressure warm water. Long wooden catwalks connect the bungalows to the central dining facility where you can get a drink, hang out with other travelers or check your email on the lodges Wi-Fi. Dinner and breakfast, which are included with your stay, is a mix of western dishes and expertly prepared Laotian dishes. We received a warm welcome from the friendly staff and given a nice drink on arrival. They were available when needed but unobtrusive. Although dinner and breakfast was buffet style they were quick to clear away used dishes and help with serving. There were various levels of English (and French) spoken but it was obvious that everyone had been trained and everyone had a working knowledge of hotel English. There were smiles and respectful “nop” (a respectful greeting, similar to a bow with hands pressed together) all around. Butterflies flit and birds sing all around the well-maintained grounds. There are even signs to help identify even some of the more unusual plants and trees. This is all wonderful but ultimately it is the river and the experience that makes the Lunag Say Lodge unique and so attractive.